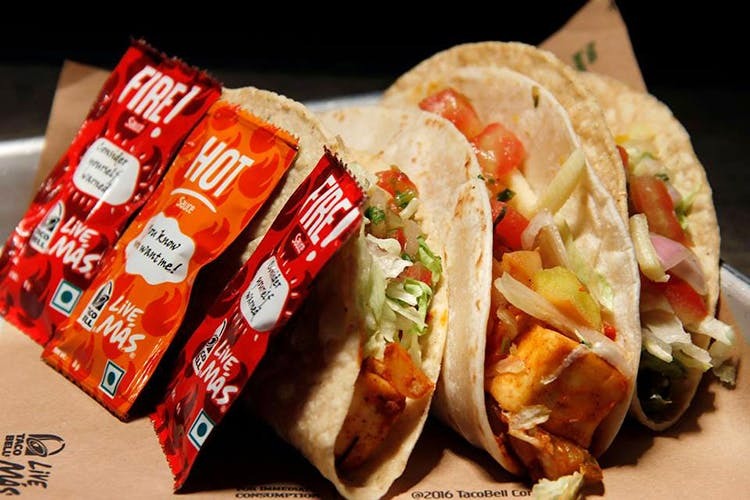 Taco lovers, remember how excited we were when Taco Bell finally arrived in Hyderabad? Let's just say that the excitement is getting doubled with its new outlet. Opening up in Hitech City, this one is going to leave all you techies indulging in Taco Wednesdays. And thank goodness, you can grab a taco at INR 99 on Wednesdays. Wednesday meal deals are also fun Naked Chicken (INR 245)/Veg Chalupa Meal (INR 199) is served with Mexican fries or nachos & salsa with unlimited Pepsi. The Weekend Taco Party stretches from Friday to Sunday where you can get 10 tacos with unlimited Pepsi that’s priced between INR 549 and INR 649. But that’s not it, there are plenty of other offers that you can score. For instance, there is a 50 per cent off on all ala carte items till 12th August. If you’re interested in trying more than just the tacos, we think you should go for the 7 Layer Burrito that comes with Fajita Veggies or Fajita Chicken, and Loaded Nachos along with their soft shakes. Plus, you just cannot miss the latest arrival – Potaco – a crispy potato serving as a taco shell.